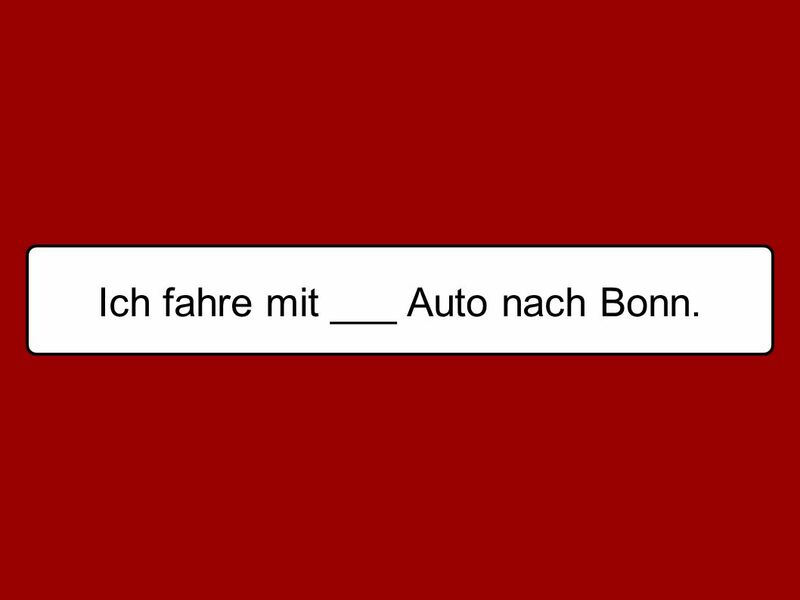 3 Ich fahre mit ___ Auto nach Bonn. 4 Ich fahre mit dem Auto nach Bonn. 5 Ich fahre mit einem Auto nach Bonn. 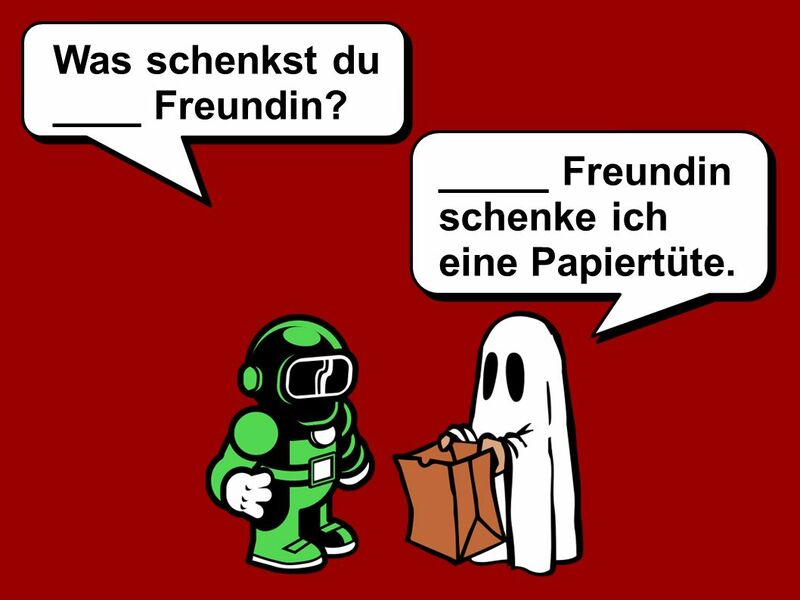 8 Was schenkst du ____ Freundin? _____ Freundin schenke ich eine Papiertüte. 9 Was schenkst du deiner Freundin? 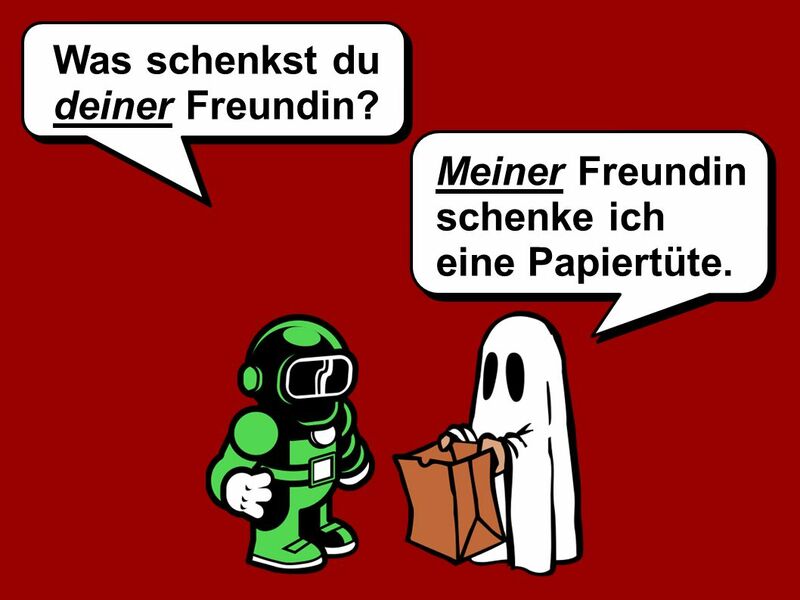 _____ Freundin schenke ich eine Papiertüte. 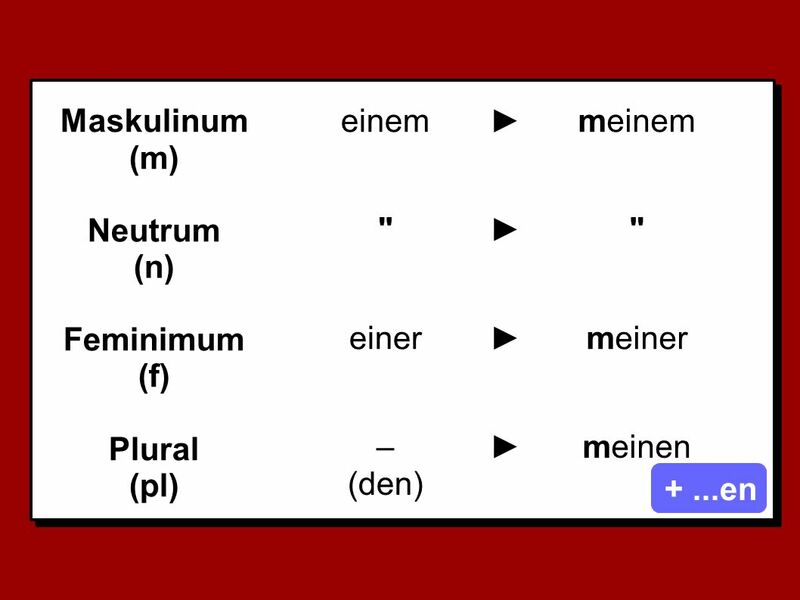 10 Was schenkst du deiner Freundin? Meiner Freundin schenke ich eine Papiertüte. 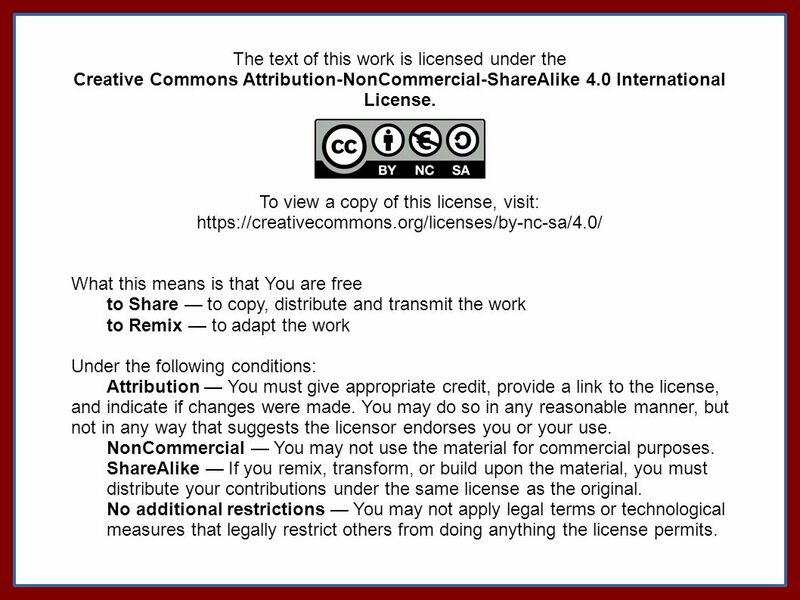 Creative Commons Attribution-NonCommercial-ShareAlike 4.0 International License. 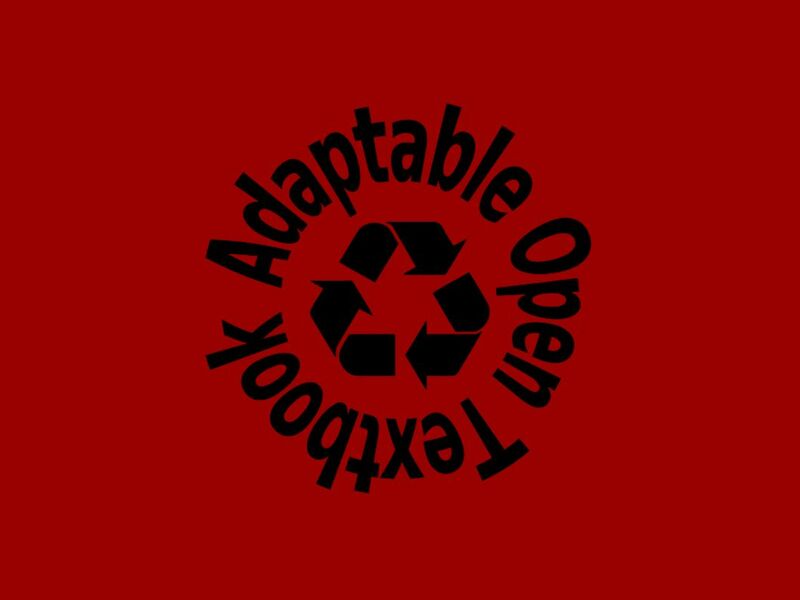 To view a copy of this license, visit: What this means is that You are free to Share — to copy, distribute and transmit the work to Remix — to adapt the work Under the following conditions: Attribution — You must give appropriate credit, provide a link to the license, and indicate if changes were made. You may do so in any reasonable manner, but not in any way that suggests the licensor endorses you or your use. NonCommercial — You may not use the material for commercial purposes. ShareAlike — If you remix, transform, or build upon the material, you must distribute your contributions under the same license as the original. No additional restrictions — You may not apply legal terms or technological measures that legally restrict others from doing anything the license permits. The text of this work is licensed under the Creative Commons Attribution-NonCommercial-ShareAlike 4.0 International License. To view a copy of this license, visit: What this means is that You are free to Share — to copy, distribute and transmit the work to Remix — to adapt the work Under the following conditions: Attribution — You must give appropriate credit, provide a link to the license, and indicate if changes were made. You may do so in any reasonable manner, but not in any way that suggests the licensor endorses you or your use. NonCommercial — You may not use the material for commercial purposes. ShareAlike — If you remix, transform, or build upon the material, you must distribute your contributions under the same license as the original. No additional restrictions — You may not apply legal terms or technological measures that legally restrict others from doing anything the license permits. 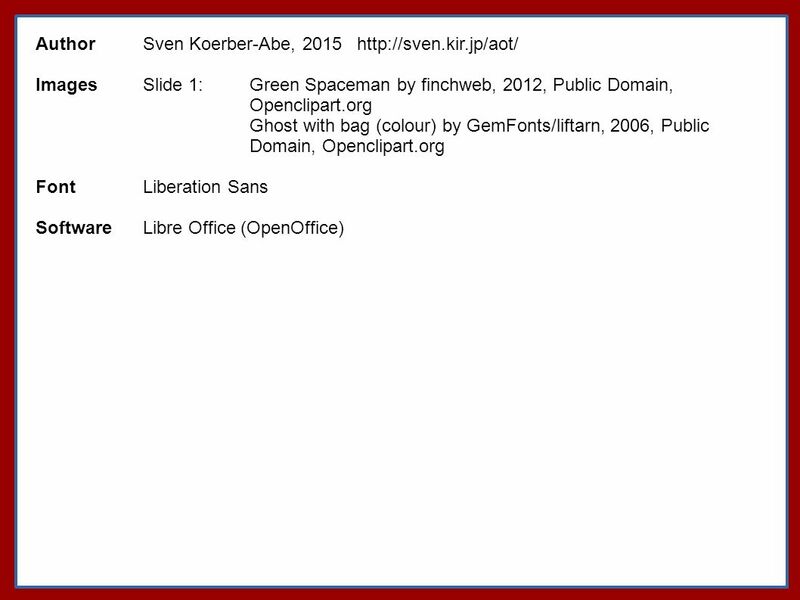 Herunterladen ppt "Dativ Sven Koerber-Abe, 2015." Was ist die Frage? Sven Koerber-Abe, Nein, ich komme aus Berlin. 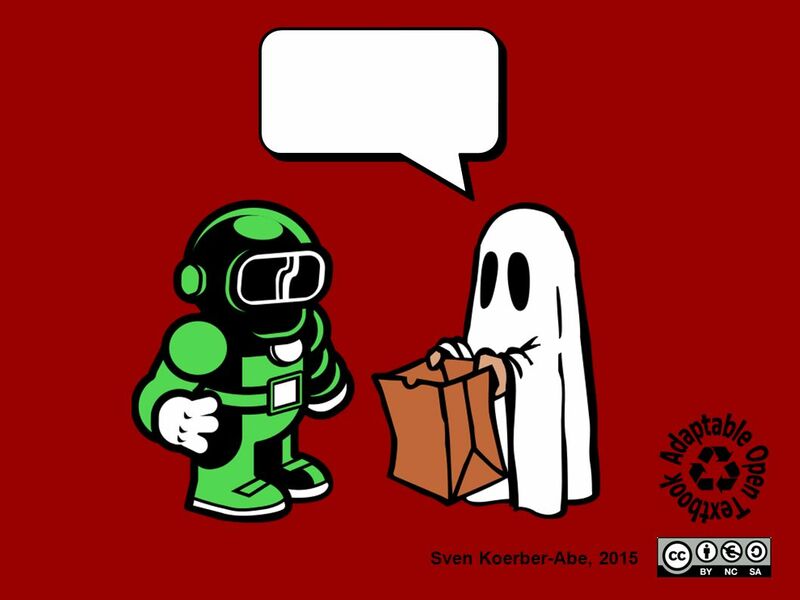 Sven Koerber-Abe, 2014 ein / eine. Fernseher m Das ist ___ Fernseher. Imperativ! Sven Koerber-Abe, Sie Essen Sie eine Pizza? Essen Sie eine Pizza. 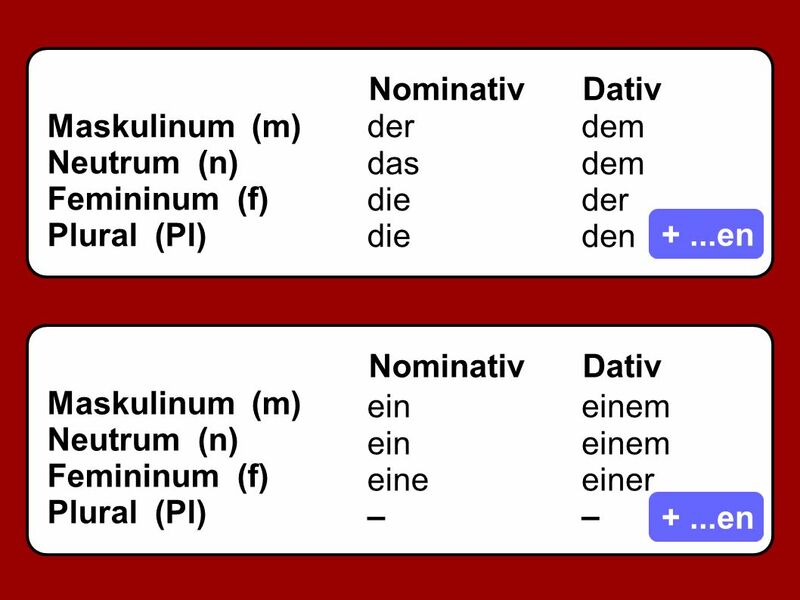 Sven Koerber-Abe, 2014 Grammatik: Perfekt Grammatik: Perfekt. Interview-Übung (Start Deutsch 1) Sven Koerber-Abe 2012. 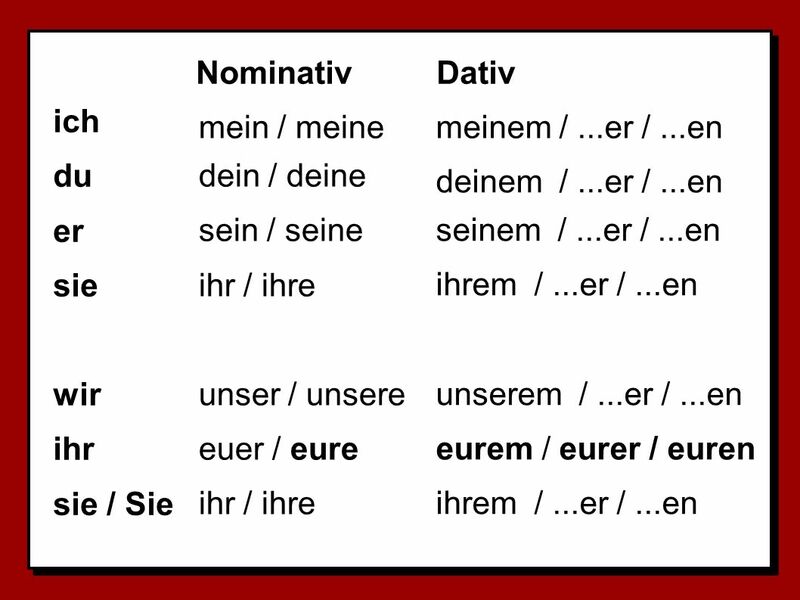 Present Perfect Tense Conversational Past.